reduce the amount of energy used to make new products. It has been Maine's goal since 1989 to reach a recycling rate of 50% of our municipal solid waste generated. The most recent numbers (for 2016) show Maine’s municipal solid waste recycling rate is at 36.79%. To help reach our statewide recycling goal, the Maine DEP provides technical and educational assistance to residents, municipalities, schools, and businesses to help increase the amount of resources that are recovered from the waste stream. DEP also collects, synthesizes, and reports data on solid waste management in Maine. Did you know that each arrow in the recycling symbol represent an important step in the recycling process? The first arrow starts with you – it represents community participation as residents bring their recyclable items to the transfer station or put them in a curbside bin for pickup. 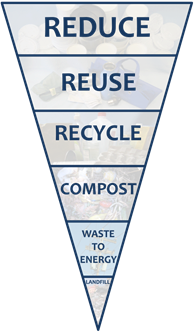 The next arrow represents the process of recycling these materials into new, usable goods. The last arrow is the one that closes the loop – that’s when items made from recycled goods are put to use. You can help “close the loop” by buying products made from recycled materials. What can I recycle, and where? What do my recyclables become? Waste costs us time, materials, energy, and money, and can negatively impact the environment. Below is information on tools and resources that can help individuals, families, offices, schools, shops, restaurants, hotels and other businesses and organizations reduce waste and save money. Use the U.S. Environmental Protection Agency's Waste Reduction Model (WARM) to measure the environmental benefits of the waste reduction and recycling efforts of your municipality or business. Carry a metal water bottle. This can save you more than $200 a year. Carry a (metal) travel mug. Coffee shops often offer discounts to people who bring their own travel mug. Carry canvas tote bags when shopping. Some stores give discounts to people who bring their own bag. Refuse plastics. Refuse plastic bags, plastic straws and other single-use plastics whenever possible. Empty soda cans and bottles of all liquids. This helps keep paper in recycling bins drier so more paper can be recycled. Empty food containers before recycling them. When recycling is cleaner, more materials can be recycled. Compost all food scraps. Compost items like coffee grounds, banana peels, vegetable cuttings and even chicken bones. Composting keeps materials out of landfills and feeds the soil at local farms or in your backyard. Earth 911 – Earth 911 provides a one-stop web site about “More Ideas, Less Waste”, including a quick search function to find out how and where to recycle all kinds of products. Maine Resource Recovery Association assists with marketing of recyclable and reusable materials, promotes market development of recyclables, and fosters professional practices To further the development of recycling and other forms of resource recovery as cost-effective components of environmentally sound solid waste management in Maine communities. Northeast Recycling Council (NERC) - NERC's mission is to advance an environmentally sustainable economy by promoting source and toxicity reduction, recycling, and the purchasing of environmentally preferable products and services. US EPA Reduce, Reuse, Recycle - Information, resources and educational materials available on ways to prevent waste and recapture material resources.